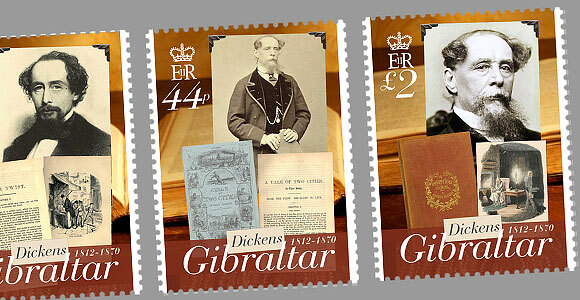 Gibraltar is commemoratimg the bicentenary of the birth of Charles John Huffam Dickens (7 February 1812 - 9 June 1870) with a wonderful issue alongside institutions from all over the world, most notably the ‘Dickens 2012’ official celebration in the United Kingdom. Charles Dickens was an English writer, generally considered to be the greatest novelist of the Victorian period and responsible for some of English literature’s most iconic novels and characters. During his lifetime Dickens’ works enjoyed unprecedented popularity and fame, and they remain popular today. It was in the twentieth century, however, that his literary genius was fully recognized by critics and scholars. Many of his works were originally published serially in monthly installments, a format of publication that Dickens himself helped popularise. Unlike other authors who completed novels before serialisation, Dickens often wrote the episodes as they were being serialised, and he often revised his plots and characters on the basis of readers’ responses to a published episode. The practice lent his stories a particular rhythm, employing cliffhangers to keep the public looking forward to the next installment.